Funding was secured in 2011 from a University of Illinois Public Engagement Grant and the ISGS to initiate a Kickapoo Geology Field Trip for the fifth graders of the Champaign Unit 4 School District. Joan Crockett of the ISGS, along with Kristin Camp, Curriculum Coordinator for Science and Health with Unit 4, were the principal organizers of the field trip. The pilot project, titled “Curriculum-based geology field trip for Champaign school students,” was designed to be a vehicle for scientific content to fulfill earth science learning objectives for 5th grade students. In October of 2011, pilot field trips to Kickapoo State Park in Vermillion County, Illinois, were successfully completed for three fifth grade classes from Champaign. In the fall of 2012, the successful pilot was expanded into a district-wide field trip opportunity involving every fifth grade class in the Champaign Unit 4 School District, which served approximately 800 students. This fall, Joan and her team of volunteers completed six field trip days for the Champaign School District, 2013 Kickapoo Field Trip season. This ISGS effort, led by Joan Crockett, is a great success for the students and is an exemplary example of collaboration between the University and the local schools. This project will continue serving every fifth grader in the Unit 4 school district with educational geoscience field trips through 2016. The Kickapoo State Park area is a unique outdoor laboratory for the study of geology and nature. 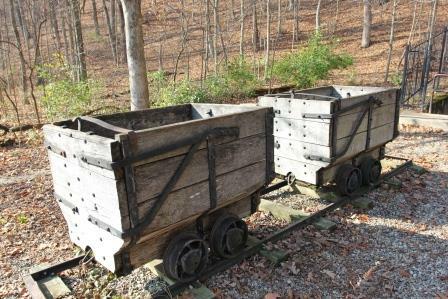 Kickapoo includes land reclaimed from historic coal strip-mining operations that began in the middle 19th century and ended in the 1970s. The Park offers ponds left behind from the strip-mining process and glacial features typical of much of Illinois are also present. Rock strata are exposed in outcrops in the area, enhancing lessons on geologic time and rock-forming processes. An old mine entrance, long sealed, inspires the children to imagine what it would have been like to mine coal underground. The Middle Fork of the Vermillion River, a designated Scenic River, runs through the park and provides an opportunity to discuss how the river flows, erodes and deposits sediment, and changes its course over time. River-worn pebbles are collected by the students, and the rock type of each is identified by ISGS geologists. These rock samples are later used in the classroom for a follow-up geology activity. An unintended, yet wonderful, consequence of walking with the students along the wooded areas and the river is their observations of nature. These have included mollusc (mussel) shells along the river, geese and turkey vultures flying overhead, wild turkey sightings, deer and raccoon tracks in the wet sediments near the river, and even a beaver-honed log. To see the delight and wonder in the students as they experienced or learned something new was remarkable.